Herbert George Wells (1866-1946) remains popular to this day, and is best known for his work as one of the fathers of science fiction. Wells was born in the county of Kent in England. Growing up, his family had considerable financial trouble resulting in Wells’s placement in various harsh apprenticeship programs as a child and teenager, giving him experiences which lent themselves to some of his novels (e.g. Kipps). He later became a teacher and, in 1895, wrote his first (and possibly most famous) novel, The Time Machine. Between 1895 and 1901, Wells published three non-fiction books and eight more novels, including The Island of Dr. Moreau (1896), The Invisible Man (1897), The War of the Worlds (1898), and The First Men in the Moon (1901). Wells wrote prolifically about social and economic issues, and put forth many volumes on better ways to organize the world. He wrote extensively on the subject of utopias and authored many non-fiction works on popular history. Yet he is remembered for little else than his science fiction, despite having published over fifty novels at the time of his death, and even more non-fiction books. Wells passed away due to undetermined medical causes in 1946. “This story is essentially the history of the opening and of the realisation of the Great War as it happened to one small group of people in Essex, and more particularly, as it happened to one human brain” (216). The titular Mr. Britling is a writer primarily of essays and non-fiction books on social issues of the day and larger aspects of human nature. The novel begins with the arrival of Mr. Direck, an American who has come to ask Mr. Britling to give a lecture in Massachusetts. Mr. Direck stays at Mr. Britling’s home in Matching’s Easy, along with Mrs. Britling, Mr. Britling’s secretary Teddy, his wife Letty and sister-in-law Cecily (whom Mr. Direck immediately falls for), Herr Heinrich (a German student), the Britlings’ two young sons, and Hugh Britling (Mr. Britling’s older son from his first marriage). The first section of the novel establishes these characters and focuses on the British attitude leading up to the outbreak of World War One. The rest of the novel focuses on how life and attitudes changed (or refused to change) while some characters left for war. The novel is mostly character-driven. World events are expressed primarily as to how they affect the characters. There is very little of the war itself in the novel, and scenes from the war are all expressed either in the form of stories from refugees or letters from soldiers on the front. The characters are complex and honest, and much of the discussion of global politics and social concerns still resonate today. There are some points where these dissertations on the ethics of war or the mechanics of attaining world peace (among other things) get hard to trudge through. If the character sounds like H. G. Wells, that’s because it, in essence, is. In Experiment in Autobiography, Wells writes: “Before the end of 1914, I had already set to work upon a record of my mental phases, elaborated in a novel, Mr. Britling Sees It Through. It is only in the most general sense autobiographical… Mr. Britling is not so much a representation of myself as of my type and class, and I think I have contrived in that book to give not only the astonishment and the sense of traic disillusionment in a civilized mind as the cruel facts of war rose steadily to dominate everything else in life, but also the passionate desire to find some immediate reassurance amidst that whirlwind of disaster” (573). Mr. Britling Sees It Through was published in England in 1916. In 1917, the United States officially joined World War One. There was no subject more at the forefront of the public consciousness. 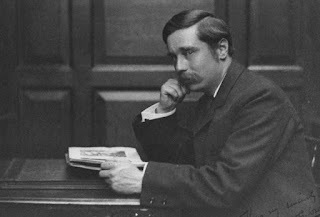 H. G. Wells was already a well-known author, so it is quite easy to see how his MBSIT would be widely read. For one thing, it deals very little with the events of the war itself, and the causes of the war are only debated upon by the characters. Additionally, since the novel was published in 1916, it did not cover the end of the war or (as would be important to a modern American audience) the American involvement in the war effort. Since the time of its publication, other novels about World War One (most notably Remarque’s All Quiet on the Western Front) have focused on the soldiers’ experience of the war, and non-fiction works that cover the war in its entirety have covered the social and political causes of the war in more detail than Wells’s novel. “Following the war, popularity swung steadily toward non-fiction, until by the mid-thirties it was outselling fiction” (Mott 241). If you have an interest in World War One, you will likely enjoy this book. The discussions on politics and ethics and philosophy are thought-provoking and worth reading. You can read Mr. Britling Sees it Through on Project Gutenberg. Wells, H. G. Mr. Britling Sees It Through. London: Cassel and Company, 1916. Print. Wells, H. G. Experiment in Autobiography. New York: The Macmillan Company, 1934. Print. I just learned about this blog and your undertaking of reading these novels. I think it's a great project, and I look forward to following along as you share your insights on these novels. Your project will benefit many readers & writers ~ what a valuable learning experience it will be. I wish you the best in your endeavor! I just finished "Mr. Britling Sees Through it" and thoroughly enjoyed it. I'd just finished reading a history of the war in 1914 and it was interesting to see how ordinary citizens in England faced the war. There is a lot of HG Wells pontificating (through Britling) about the war and humankind in general. Sometimes it gets a little long. As you say it's primarily character driven. Some of the characters are memorable. Mr. Britling himself; Mr. Direct, the American who falls in love with a far distant cousin when he visits; Cissy (the cousin) with her wild athletic way and her refusal, through most of the book, to admit to herself that she cares for Mr. Direct; Hugh, Britling's son, mostly through his letters from the front. I really got to care for some of these characters. The scene where Mrs. Britling, but not Hugh's mother, tries to comfort her husband when they hear of Hugh's death almost brought me to tears.